Sometimes you have a sapling or other type of woody perennial coming up where it is not wanted. Getting rid of them presents a problem because if you cut them down, they will just grow back again. I have a few areas on my place where I haven’t been able to mow for a few years, and I haven’t known what to do because of this very problem. Short of tethering goats on the spot all summer, I found another means to getting rid of these perennial weeds. Immediately (within a minute) paint the cut with full strength (concentrated, not diluted) Round-Up. I have considered trying this technique for some time, but haven’t. 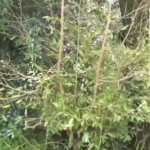 In the video, Greg asserts that it never fails him, whether the tree is large or small. While I am not a big fan of using herbicides, a judicious application as indicated in the process seems both environmentally sound and safe.